These vans are sold as seen to business users only. If you drive into London on a regular basis it will soon become very important to have a Euro 6 van. These vans have the latest emissions reducing technology to help you avoid any additional charges being implemented for higher polluting vehicles. All used vans are subject to a £50 administration fee. All used vans benefit from a 3 month or 3,000 miles parts only warranty (which ever comes sooner). 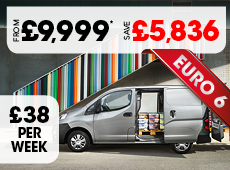 Finance packages are available only on vans which have covered less than 50,000 miles and are not older than 5 years. In some rare instances we may be able to offer finance on older vans, please enquire for more details.